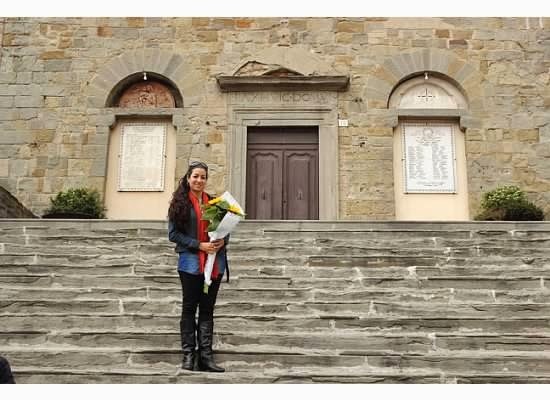 Cortona is located in the southeastern part of Tuscany. I was excited to taste the wines of Fabrizio Dionisio because Cortona is one of my top favorite towns in Tuscany. I also loved that he features wines made from Syrah since I wasn't aware of this grape being grown here, but after tasting these wines and learning about the success of this grape in this terroir I was very pleased! The two vineyard sites they own are Il Castagno and Poggio del Sole. The winery is now run by Fabrizio Dionisio, but his father Sergio Dionisio founded the estate in the early 1970's with originally about 17 acres (7 hectacres). Years later in 1992 he purchased another estate that now brings their total acreage to about 37 acres (15 hectacres) with about a 30,000 bottle production. 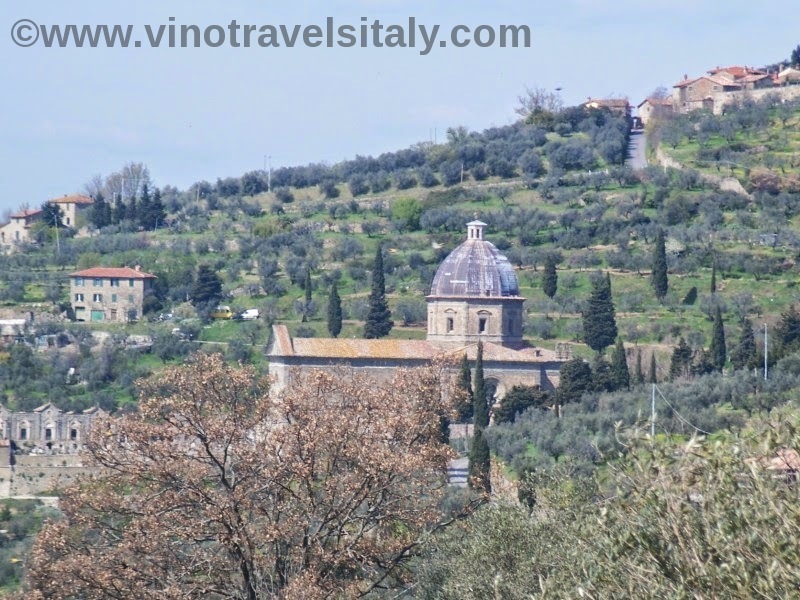 The estate and vineyards are set in the hills of Cortona surrounded by the splendid sunflower fields and olive groves and perched up on the hill is the fabulous town of Cortona. The vineyards were completely replanted in the early 2000's with the syrah grape and small amounts of merlot and cabernet sauvignon after the trebbiano and sangiovese grapes that had been growing there were overgrown. The labels of the estate are fun as the daughter of Fabrizio drew them. I tasted the 2011 Castagnino and Il Castagno. The Castagnino is the little brother to their signature wine, Il Castagno. The difference between this wine and that one is that the Castagnino is not aged in oak and is instead aged in stainless steel and cement vats. The nose is very appealing on this wine because the aromas of the fruit are very rich. It's a very fruit driven wine dominated by plums and blackberries. It is full bodied with nice concentration and soft tannins. Probably a great match with a steak in a red wine glaze. 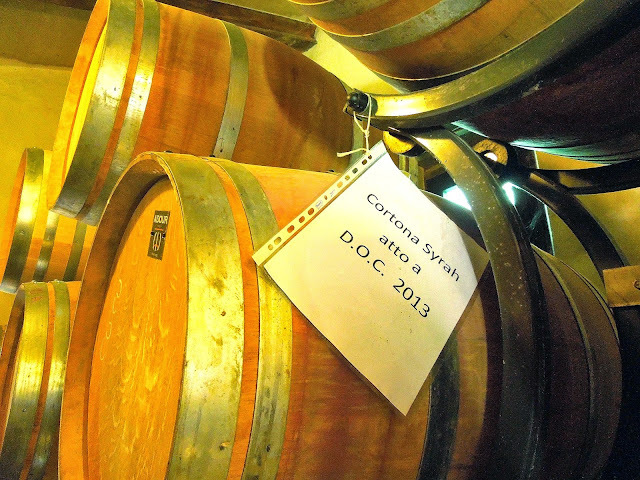 The signature wine, Il Castagno D.O.C., was first produced in 2003 and is made of 100% syrah. It is produced in low yields as the Castagnino also is. Fermentation and maceration both take place for 3 weeks a piece and the malolactic fermentation is off of the free-run juice as the winery never presses their grapes. Its on the lees for about 15 months and aged in french oak barrels. On the nose is enjoyable vanilla from the oak. This wine is very structured and well balanced with rich black berries aromas and spice, but also has a velvety and silkiness throughout. Both of these wines have received multiple awards from Antonio Galloni, Wine Spectator, James Suckling and the Wine Enthusiast. “It is our conviction that such a method of operation is the best way to respect, and to please, not only nature and its fruits, but those as well who will be enjoying our wines. Drink the calabrese wine of champions!